Whether it's the perspective from their position behind the plate or their ability to multi-task on the field, conventional baseball wisdom says that catchers make good managers. A look up and down the organizational charts of any Major League franchise shows a number of former catchers who have made the transition from backstops to bench bosses. What is it about the position that makes a catcher better suited to serve as a skipper than many of their teammates? "I get that question a lot," said St. Louis Cardinals skipper and hockey dad Mike Matheny. "It's just part of the job description for a catcher, where you have to understand what's going on with the pitching, what's going on with certain defenses, what's going on with the status of the team and understanding the game situation, not just my space right here." It's more than just the "tools of ignorance" - a term long used to describe a catcher's protective gear-that links the position to a goaltender in hockey. It's the perspective one gets from standing between the pipes as a team's last line of defense that potentially makes a goaltender uniquely qualified to make the move into the coaching ranks. "Those two positions, catching in baseball and goalie in hockey, are analytical positions," said John Vanbiesbrouck, a Hall of Fame goaltender who was also an accomplished baseball player growing up in Michigan. "You're observing, reading plays, reading how things develop as you come off the bench, matchups, who does well against each other. Your interpretation and observation are at a different level than other positions." 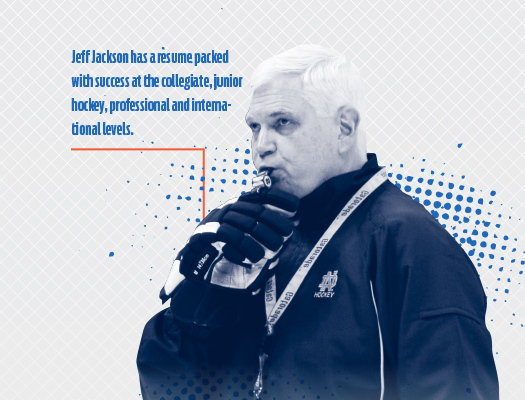 From Notre Dame's long-time head coach Jeff Jackson to Seth Appert with USA Hockey's National Team Development Program to Detroit Red Wings head coach Jeff Blashill, a number of former goaltenders are making a name for themselves behind the bench at all levels. "Playing goalie gives you a unique perspective, definitely different from a skater. Whether it's advantageous or not to preparing you to become a coach, I don't know," said Blashill, who completed his third season as the Red Wings head coach. "The position probably gives you a certain unique perspective, but I also think that when you're on the bench even though you're not part of the action, you get a chance to learn a lot that way too." 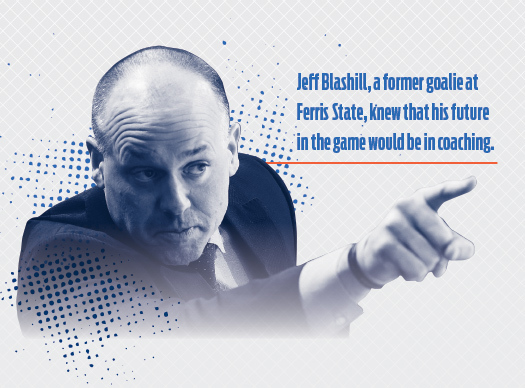 That served Blashill well during his four years at Ferris State University, where his head coach, Bob Daniels often viewed the Sault Ste. Marie, Mich., native as another coach on the bench, asking his opinion during games. "Ultimately I'm a coach because of him," Blashill said of his former coach and mentor. "My senior year in college it was evident to me that I wasn't going to go real far in pro hockey as a player. [Coach Daniels] thought I had some of the attributes that would make a good coach. That really jumpstarted my career." 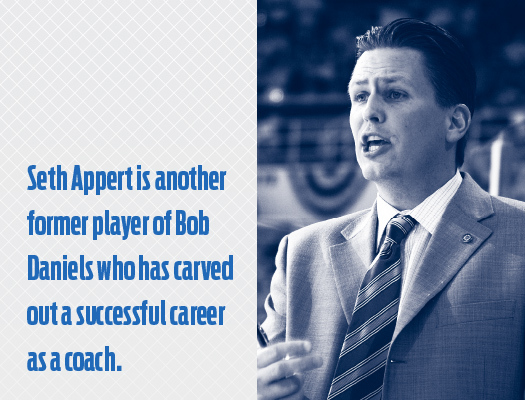 Appert is another of Daniels' disciples who used his time in Big Rapids, Mich., to launch a coaching career that has led him to the upper echelons of the profession, first as a seven-year assistant with the University of Denver and then with Rensselaer Polytechnic Institute, where he was the head coach for 11 seasons before joining the NTDP. "He has a knack for finding guys that he thinks are going to be good coaches and seeing qualities that maybe they don't even see," said Appert, who led this year's U.S. National Under-18 Team to a silver medal at the IIHF World Under-18 Championship. "At that point in my life, I felt like I accomplished my dream as a player of playing Div. I hockey. My dad gave me great advice. He said, whether you decide to keep playing or start coaching, make a decision and never look back. And I've never regretted it." As a former goaltender, Appert knows what his players are going through, and that perspective allows him to take a different approach to dealing with them. While some coaches take a hands-off approach to those who play the position, Appert has never treated his netminders with kid gloves. "I think the one thing that former goalies understand is that you can be harder on goalies than most coaches are willing to be," Appert said. 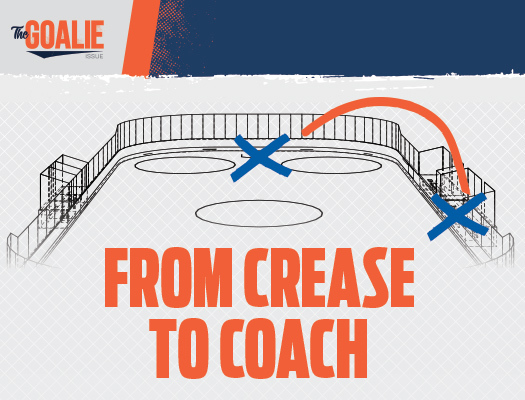 "Most coaches are afraid to be demanding of their goalies in terms of their work ethic or if they let in a soft goal. "You have to have great respect and understanding of the pressure and the position, but I'm a big believer that the goalies need to be held accountable to the highest level because they need to be the backbone of your team." That means that no matter what happened on the previous shot, whether it resulted in a spectacular save or the puck found its way to the back of the net, any goalie worth his or her salt knows the most important shot is the next one he or she will face. "It's a position you really have to adapt quickly because when you get scored on you have to put those emotions aside, and that's kind of hard to do," Vanbiesbrouck said. "It's the same thing when it comes to coaching in hockey, you have to put a lot of emotions aside. That's why you see a lot of stoic coaches. It's not that they want to be stoic. Their emotions are probably raging inside but they have to keep it under control. I think that all goes into the pot together."